ROCHESTER, N.Y. – Semrock's new BrightLine Laser Dichroics are ideal for laser-based fluorescence microscopy, and complement Semrock's well-established line of reliable, hard-coated fluorescence filters and dichroic beamsplitters for wideband fluorescence microscopy. The new Laser Dichroics are optimized for the most popular lasers used for fluorescence imaging, including newer all-solid-state lasers that are rapidly replacing older gas-laser technology. These 45 degree beamsplitters offer excellent reflection at the laser wavelengths, regardless of polarization, combined with high transmission and very low ripple over extremely wide passbands – out to 900 and even 1200 nm. And the transition from reflection to transmission is exceptionally steep (< 2.5% of the longest laser wavelength) to enable maximum capture of even weak signals close to the laser line. Semrock's new Laser Dichroics are designed for use in laser-scanning and spinning-disk confocal microscopes, as well as total-internal-reflection fluorescence (TIRF) microscopes. They are also ideal for any fluorescence microscope or imaging system that demands premium spectral performance and/or beamsplitter flatness, such as structured illumination systems for reduction of out-of-plane noise. And, the Laser Dichroics are a perfect match to Semrock's value-priced EdgeBasic™ line of long-wave-pass filters for Raman spectroscopy and fluorescence imaging. 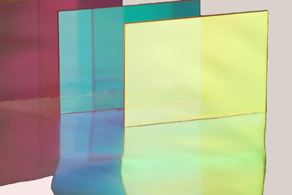 Like all of Semrock's thin-film optical filters, the new Laser Dichroic filters are hard-coated using Semrock's ion-beam sputtering deposition process for permanent "no burn-out" optical durability and lasting reliability even in harsh environmental conditions, and they are backed by an industry-leading five year warranty.